Now that you have a learned a little about our incredible screen printing and embroidery services, are you still finding yourself seeking something else? Not a problem! We offer so much more. If you are going for an old-school, vintage look or you just want something with more layers and textures, try a custom applique design. Custom applique graphics are part of our embroidery services, but they aren’t what you think when you hear the term embroidery. Instead, they are pieces of fabric, embroidery, or other materials that are sewn onto your apparel. This technique can work for any of our products, and the versatility of this technique gives you a ton of great design options. Why would you trust a monkey for your custom applique designs? Fortunately, I’m not the one doing any of the sewing—that’s all up to the incredible folks I work with. We are the pros when it comes to custom apparel and have been in business for more than 15 years and have served countless customers all over the world. Yep, you heard right, all over the world! This means my friends here have had over a decade to perfect all of the services they offer, including the applique services. This company has some very humble beginnings, and although the customer base has grown significantly, the love and dedication that goes into each product has not been diluted by numbers. You can feel rest assured that your apparel is made using high-quality materials and that each order is checked for quality and accuracy before it is shipped out. This means the design you create is exactly what you get in a timely manner. Know what you like and can’t seem to find it in stores? Well, that’s where we come in. 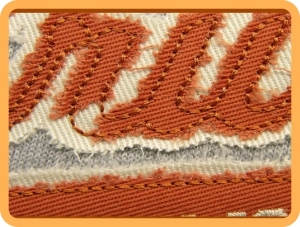 Like any of our other custom design services, you can make patterns, images, and lettering using our applique services. This gives you the freedom to choose exactly what you want your clothing to look like, and will ensure that no one else will have anything quite like it. Plus, appliques give you another level of customization because of their unique layering abilities. You also have the option of combining an applique with any of our other services for a truly unique look. Contact us today to learn more about our applique services. We are based in Northeast Minneapolis, Minnesota, and proudly serve all of the Minneapolis/St. Paul area and ship products to customers nationally and all over the world.